Create a basic template from an existing project or a new console app project. Pack the template for distribution at nuget.org or from a local nupkg file. Install the template from nuget.org, a local nupkg file, or the local file system. If you prefer to proceed through the tutorial with a complete sample, download the sample project template. The sample template is configured for NuGet distribution. Move the contents of the content folder of the sample up one level into the GarciaSoftware.ConsoleTemplate.CSharp folder. Delete the empty content folder. Install the .NET Core 2.0 SDK or later versions. Read the reference topic Custom templates for dotnet new. Use an existing project that you've confirmed compiles and runs, or create a new console app project in a folder on your hard drive. This tutorial assumes that the name of the project folder is GarciaSoftware.ConsoleTemplate.CSharp stored at Documents\Templates in the user's profile. The tutorial project template name is in the format <Company Name>.<Template Type>.<Programming Language>, but you're free to name your project and template anything you wish. Add a folder to the root of the project named .template.config. Inside the .template.config folder, create a template.json file to configure your template. For more information and member definitions for the template.json file, see the Custom templates for dotnet new topic and the template.json schema at the JSON Schema Store. NuGet distribution: install the template from NuGet or from the local nupkg file, and use the installed template. Create a folder for the NuGet package. 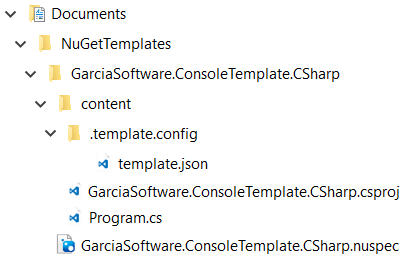 For the tutorial, the folder name GarciaSoftware.ConsoleTemplate.CSharp is used, and the folder is created inside a Documents\NuGetTemplates folder in the user's profile. Create a folder named content inside of the new template folder to hold the project files. Copy the contents of your project folder, together with its .template.config/template.json file, into the content folder you created. Next to the content folder, add a nuspec file. The nuspec file is an XML manifest file that describes a package's contents and drives the process of creating the NuGet package. Inside of a <packageTypes> element in the nuspec file, include a <packageType> element with a name attribute value of Template. Both the content folder and the nuspec file should reside in the same directory. The table shows the minimum nuspec file elements required to produce a template as a NuGet package. <authors> string A comma-separated list of packages authors, matching the profile names on nuget.org. Authors are displayed in the NuGet Gallery on nuget.org and are used to cross-reference packages by the same authors. <description> string A long description of the package for UI display. <id> string The case-insensitive package identifier, which must be unique across nuget.org or whatever gallery the package will reside in. IDs may not contain spaces or characters that are not valid for a URL and generally follow .NET namespace rules. See Choosing a unique package identifier and setting the version number for guidance. <packageType> string Place this element inside a <packageTypes> element among the <metadata> elements. Set the name attribute of the <packageType> element to Template. <version> string The version of the package, following the major.minor.patch pattern. Version numbers may include a pre-release suffix as described in Pre-release versions. See the .nuspec reference for the complete nuspec file schema. Creates the Garcia Software console app. To publish a NuGet package, follow the instructions in the Create and publish a package topic. However, we recommend that you don't publish the tutorial template to NuGet as it can never be deleted once published, only delisted. Now that you have the NuGet package in the form of a nupkg file, we suggest that you follow the instructions below to install the template directly from the local nupkg file. The example is for demonstration purposes only. There isn't a GarciaSoftware.ConsoleTemplate.CSharp NuGet package at nuget.org, and we don't recommend that you publish and consume test templates from NuGet. If you run the command, no template is installed. However, you can install a template that hasn't been published to nuget.org by referencing the nupkg file directly on your local file system as shown in the previous section Install the template from the local nupkg file. When you list the templates with dotnet new -l, you see the NUnit 3 Test Project with a short name of nunit in the template list. You're ready to use the template in the next section. The console shows that the project is created and that the project's packages are restored. After the command is run, the project is ready for use. Could not find something to uninstall called 'GarciaSoftware.ConsoleTemplate.CSharp'. To distribute the template, place the project template folder in a location accessible to users on your network. Use the dotnet new command with the -i|--install option and specify the path to the template folder (the project folder containing the project and the .template.config folder). After the template is installed from the file system, use the template by executing the dotnet new <TEMPLATE> command from the directory where you want to the template engine's output placed (unless you're using the -o|--output option to specify a specific directory). For more information, see dotnet new Options. Supply the template's short name directly to the dotnet new command. To uninstall the template from your local file system, you need to fully qualify the path. For example, C:\Users\<USER>\Documents\Templates\GarciaSoftware.ConsoleTemplate.CSharp will work, but ./GarciaSoftware.ConsoleTemplate.CSharp from the containing folder will not. Additionally, do not include a final terminating directory slash on your template path.